Have no fear. “Touch” and “Hate” are just shortened forms of two Joan Jett songs: “Do You Wanna Touch Me?” and “I Hate Myself for Loving You.” These are just two examples of Jett-related slang that Jettheads have accumulated over the years. This glossary is an attempt to aid new Jettheads and casual observers by defining our lingo in one place. Please feel free to add new terms, correct any of the definitions, or ask questions in the comments below. I’ll update the glossary periodically with your suggestions. Alley Abbreviation for “Up Your Alley,” the album of that name released in 1988. BH Abbreviation for “Blackheart.” See Blackheart. BHR Abbreviation for Blackheart Records. Cherry Abbreviation for “Cherry Bomb,” a song by The Runaways from “The Runaways” album released in 1976. 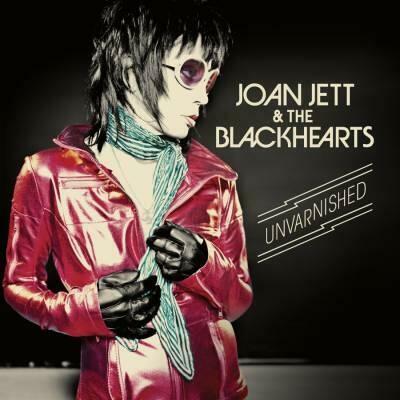 Joan Jett and the Blackhearts reworked the song for the “Glorious Results of a Misspent Youth” album released in 1984. Everyday Abbreviation for “Everyday People,” from 1983’s Album. This song is killer live, complete with a dueling guitar solo by Joan and Dougie that makes me weep. GROAMY Acronym for “Glorious Results of a Misspent Youth,” the album of that name released in 1984. ILRNR Acronym for “I Love Rock ‘N Roll,” an Arrows cover song released on the album of the same name at the end of 1981. Jett Eye Lock, The Also “Jett Eyelock” and “Jett Eye-lock.” The exchange of energy experienced by fans when Joan Jett locks eyes with us during a performance. OK, I realize that this one makes us sound crazy, but it happens, and we talk about it often. You need to experience this yourself to believe it. JELA Acronym for Jett Eye Lock Alert. Jetthead A devoted fan of Joan Jett. JJ Acronym for Joan Jett. JJBH Acronym for Joan Jett and the Blackhearts. LOD Acronym for “Light of Day,” the song written by Bruce Springsteen for the 1987 movie of the same name that starred Joan Jett and Michael J. Fox. MTM Acronym for “Mary Tyler Moore.” Specifically refers to Joan Jett’s cover of “Love is All Around,” the Mary Tyler Moore TV show theme song. It was recorded for a commercial to promote NCAA women’s basketball in 1996 and was later released on the greatest hits compilation “Fit to be Tied” in 1997. P&S Abbreviation for “Pure and Simple,” the album of that name released in 1994. Touch Abbreviation for “Do You Wanna Touch Me?”—a Gary Glitter cover song from the “Bad Reputation” album. See “Bad Rep” for additional information. UYA Acronym for “Up Your Alley.” See Alley. No, I don’t,lol. I would hope that I wouldn’t have to say that out loud, but I did, just in case. haha. LOL, yeah, I can definitely see that. That’s great! I didn’t know the “Joanzin’” thing. Your blog is really great, I love it. Thanks!! I’m glad you like it. These are hillarious. Gotta love the infamous “eye lock”, and oh yeah to whoever called it the eye F@#$! How about DOG, short for “I Wanna Be Your Dog”? KOTL for “Kiss On The Lips”. Ooooh! I forgot about KOTL and Dog! I will add them tonight. Thanks. I got the Jett Eyelock on April 23, 2010. I have footage! LOL I’ll never forget it. I’m Joanzin real bad right now ! Oh God! Eye lock is soooo freaking awesome! I I was in the 4th row at a concert in 2012, when I got my 1st, 2nd, 3rd and 4th eye locks and winks. It was so awesome! I’ve been told that I do that pretty well, and I have big brown eyes, that I’ve been told are beautiful. Of course nothing beats Joan’s beautiful eyes. I wanted her to know that she is my fantasy. Oh Joan! You made me so happy that night ! I hope to have “The Jett Eye Lock” in 2014……I will probably pass out if I do but it will be worth it for sure LOL.